The Pareto Principle of product work: Just understand it! Your boss is back from a trade fair. Or, a better boss, from an innovation camp. Possibly, he met a startup. He could’ve also heard what the competition does, or a guy next door he knows well, he read a report, downloaded a 5.000$ Research paper. He might’ve even allayed the market data. And you what’s coming. He will meet you and he will tell you „Here’s the idea. This and that is what people are doing now. … We’ll do that too. In fact we need it. Now.“ So: Will we? Do it? It also happens on a lower level in the form of „Oh, this one needs to be blue. The button needs to go to the right. Above the fold, you know! ?“ The level on which that is happening doesn’t matter that much. It is what is happening that matters. It is the wrong thing. It is aimless activism. It is doing things for the sake of doing things. It’s silly and it doesn’t make sense. And it is what we see in many environments: Doing things not knowing why and even less knowing why these and not any other arbitrary things. Entropy and chance are king, purpose is the peasant. and the fate of the company lies in the chance of whom the boss meets for lunch. 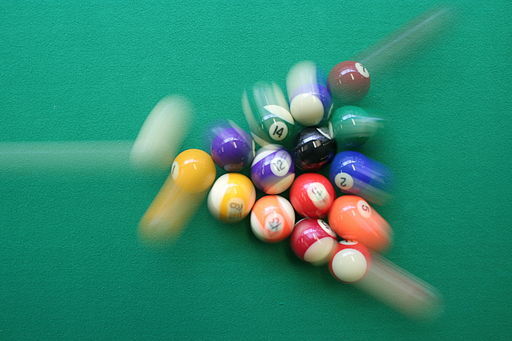 But to hell with it: It sounds cool and it dominates company cultures: Doing things. Isn’t calling someone a man of action or a doer full of praise? Doers make poster boys, heroes sometimes. Well, we think, first of all, just doing things is pretty much unreflected. And worst of all, companies are full of that mentality. Extrovert alpha people have the saying and dominate a hung ho company culture of winning. Introvert delta to omega people watch and whine while thinking to themselves. What else should they do? All this just doing things of course leads to doing just more things. Everyone is busy and utilized doing something. Something being written bold.Because what reals success and real problem solving needs is depth and purpose. Now depth and purpose written in bold. And everything else has its cause in the doers energy being drawn from themselves and directed to pleasing them, but not the company. (But behold: We also need them and their energy!) Try to work on vision and mission and strategy with a doer that goes beyond „earning money, increasing revenue“! If you can get him there it’ll proof to be hard work. And once you got them there, they’ll be the first to abandon them once the first opportunity lurks around the corner – the first opportunity to just do something, the next feature, the next initiative, the next revenue stream, the next acquisition. And they’ll sell hunting opportunities the new strategy. And everyone will be running around again, doing even more and the doers will have ideas a dozen to let us just do things, keep us busy. What was our goal again? I won’t go deep into explaining the modes, as the names are chosen pretty smart and self explanatory. We could do this in any model, but Vijay has done something remarkable for us by ordering the modes along the dimensions of i) ‚understanding‘ to ‚making‘ and ii) abstract to real. Typical answers: which modes where NOT used? People leave out most of the time what design thinking calls empathy, knowing people, their concerns, problems, emotions. Second on the list is usually know context. This is the deep consideration of the context of our solution (product, service, etc.). If you think about the fact that a product is a solution in a context for certain people that is actually a troubling thought. 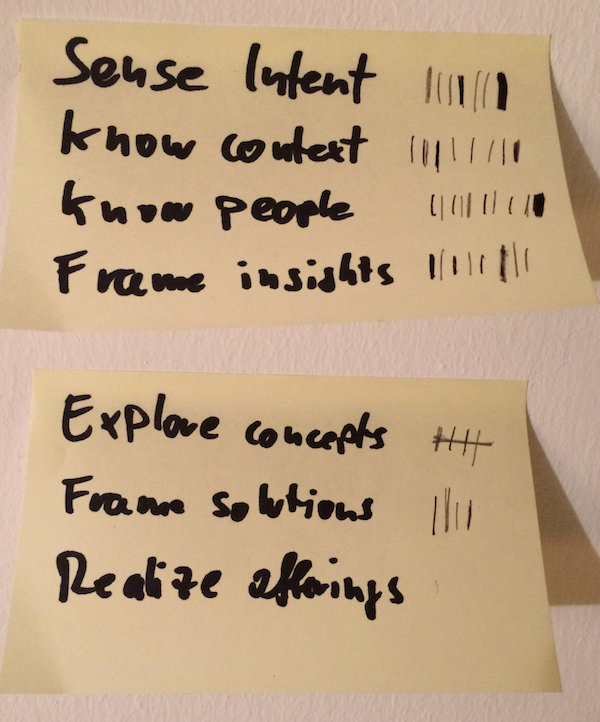 The next mode being left out is framing insights (of course – as they don’t know people and context there aren’t any.) 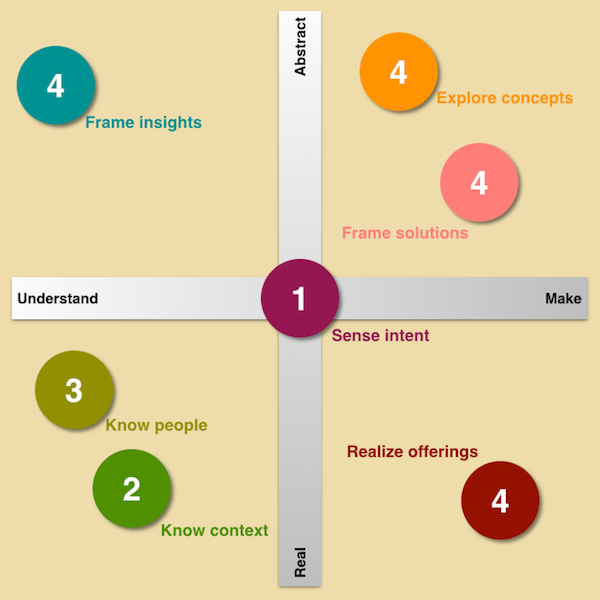 But only framing insights in different ways gives way for great solutions and valid solutions. Not framing insights means small time offerings with short life span and without vision. It is one of the core pillars of any design – service design, experience design, product design – to look at a problem and it’s possible isolation from lots of different angles and thus make it a more vli solution. And then the very beginning of solving problems, the very first glimpse an sense of an actual intent is left out. The big WHY of doing things dos not happen. If you look at the picture above again, the big picture of left outs is: we are leaving out the understand side of doing design work. We are busy making, doing. Because: Make is understood, make is visible, make looks busy. In the area of make you can smell the action. The cultural divide is with accepting the understand part: The insights of this phase are not visible, the actions not heroic. They must – against huge incomprehension – be sold dearly and communicated painstakingly precise and even better they need to made an experience. Because winners are doers and losers are thinkers, busy with understanding. But once we make the results of our understanding, our insights, an experience and comprehensible, the jokes on us! The loser gets to be a winner and the doer gets to be an unfounded loser, doing things for the sake of doing things without understanding. Of course he thinks he lives on intuition, but you know: This is the one in a million chance. For starters you just need to lock yourselves and some Colleges into a room for half a day to really think about which problem you intend to solve for which reason (sense intent). And for all of this you don’t even need an agency or us (even if we are happy o do it for you – or much better: with you!). You can really start doing all of this today, right now. Just like that. That’s the trick. Today. This is not a good new years resolution. Start today! Customers are roaming the streets, approach and ask them questions. Once you make clear that your intent is to solve their problems and you are serious about it, the interviews feel like therapy. If you don’t have clients on the streets, ask service to get them in, they know where they are. It just takes a little bit of will and discipline and a little bit of stolen work time. But that’s fine: Will and discipline is what makes us human beings. And then, but only then, if you’ve done your homework, there will be a reward and things can, all of a sudden, go pretty fast, just like the doers like: Paula Scher sketched the logo for the city Group „in a second done in 34 years“. You can google the whole story easily. The thing now is: Once the balance between make and understand is back (because you pushed) the whole perspective of the enterprise on the old ‚make’ will change and the old ‚make’ will be seen as ‚just doing things’. And ‚just doing things’ will now look absurdly stupid. And no one will know how we actually git there. Instead everyone will look for the right foundation of understand, and the energy of doers will be appreciated as a positive one as soon as they stay out the way of understanding Dafür wächst jetzt das richtige Verständnis dafür, dass Verstehen die Grundlage ist, die Umsetzungsenergie aber vom Machen kommt! As so often, it is important that both enrages will be made explicit and made use of for what they are at the right time in the right context. And then, respect for both will emerge for both necessary sides of the spectrum. But as, in the most companies there’s still quite n unbalance towards just doing, it is quite a safe bet to push for understand. And therefore the Pareto principle of product nearly everywhere seems to be: Just understand (it)!. Thanks for the title picture to Noé Lecocq used under a CC license.